Sturdy straight-legged black pants with elastic gathered waist, and lace-up side leg seams. Size Medium comfortably fits waists 28" to 36", size Large will fit sizes 32" to 40". 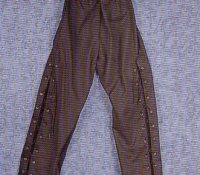 Both sizes feature a length of 30-32. Available in Black only. These work great with boots!